I began taking a class yesterday on contemplative prayer. This is a form of prayer in which we are called to be completely still for a period of time. It is much different than the way I normally pray, taking my every thought and request to God. I have come to realize that I spend most of my prayer time talking. That is why this class interested me so much, it will teach me how to listen. My first assignment was to learn this week how to practice mindfulness. That means to live in the moment and be aware of God’s presence at every point during the day. I was encouraged to spend 15 minutes this morning and 15 minutes this evening being perfectly still, perfectly quiet, and living in that moment. Sounds simple right?? Wrong! It was incredibly hard. Being physically still was the easy part. However, quieting my mind was extremely difficult. It kept jumping between events that happened yesterday or a week ago, all the way over to the things I need to accomplish today or this weekend. Yes, to just sit and listen, to quiet my mind so that I might be aware of God’s presence was very difficult for me. I guess that shows how much I really do need this class. However, for the few minutes I was able to, I found that the practice provided me with some much needed peace and clarity. To be able to sit and commune with the risen Savior does provide us with a “food” we know nothing about. It is a soul feast in which our spirits are filled with His presence and nourished for the journey to come. It is a form of power and energy with which we are not accustomed. It can become, I can see, quite addictive if we stay with it. I am sharing below a poem written by my teacher, the Reverend Dr. William Thiele, a pastor in the United Methodist Church in New Orleans. After reading this poem yesterday, I was more than convinced to try this prayer method. Maybe it will be an encouragement to you as well. in a surgeon’s hands too. until he can’t speak at all. of the ones I will love today. I won’t be there either. I stepped out onto my back porch this morning to an incredible sight: ELECTRIC GREEN! You know that color don’t you? The neon hue that adorns all the plants and bushes just as they begin to sprout anew in the springtime? It is a different green than we see the rest of the year. It is brand new; young and vibrant. And when mixed with the crispness of the air, the smell of the coming rain, and the singing of the birds – it brings an amazing amount of energy, joy, and even hope to our sensibilities. This green does more than simply herald the coming of the new season. For me, it affirms something I know (but maybe have forgotten in the dark days of winter.) This electric green reminds me that God is real and He is working to renew everything in my world. 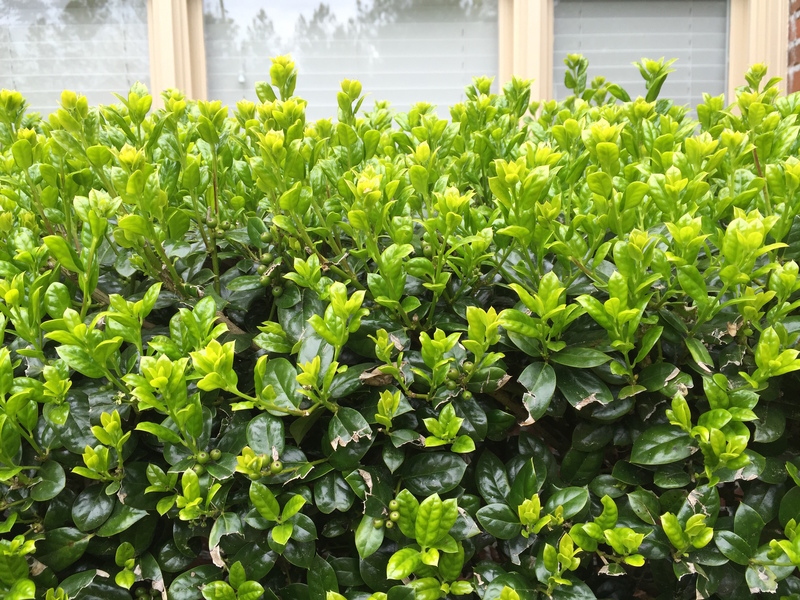 Being able to touch the new growth on my backyard bushes is a visible and tangible reminder that God is always at work in my life renewing, regenerating, and helping me to begin again. What a grace of our Father in heaven. We are told that those who believe without seeing are truly blessed. Those who have faith in the absence of proof – they are held in high esteem by the Almighty. And, sometimes, I am one of those people. But many times, I am not. Many times in the midst of discouragement and disappointment, it is hard for me to believe that God is still engaged in my affairs. Sometimes when I have waited and prayed for so long with no discernible answer, I find myself doubting and wondering if He is even there at all. But in His infinite mercy, He doesn’t hold those thoughts against me. Instead He does just the opposite. He gives me a sign, like these bushes that say, “I am still here with You.” He gives me hope in a way that I can understand it. And what a gift! After all, He is the God of the universe, and He owes me nothing. But His love for me is made real in these reminders that are popping up all around me. I am humbled when I behold His handiwork – to know that He cares enough to help me over the hard days when my faith waivers and my emotions are overtaken with feelings of abandonment. Indeed, He is my Good Shepherd. How about you, friends? Are you aware of God’s work in your life today? Have you taken the time to look around for those signs that He is with you and will never forsake you? Oh, please do. They are there. We just have to slow down and look for them. Allow His grace to flow over you today and be renewed in your spirits. Regardless of where you have been, allow Him to minister to your soul, renew your heart, and to create a new hope and way of seeing things today. For He is good, all the time. Yesterday I attended the funeral of my father-in-law. He had lived here near my family for a couple of years. Before that, he had been retired to the Alabama Coast for about 15 years. And before that, he had lived for over 30 years in Pennsylvania. So where would we have the funeral? There was no question. We were going home. After the service, our family gathered at the First Baptist Church. There, members had been busily working all morning to prepare lunch for us all, as well to provide a place for us to gather and reminisce. These kind-hearted people have done this on many occasions for our family, and we indeed consider this our family church. I find it interesting that none of our generation have ever attended a service there. We knew none of the people serving us. However, that didn’t seem to matter. We are welcomed there and loved every time we step through the door. We are counseled by a pastor that only knows we are part of the family. We are fed and consoled by people that we have never met. What causes this? See all those folks ministering to us yesterday, they didn’t know us. But they knew Poppy. And they knew grandmother and grandaddy. And they knew the generations of Johnsons that have come before us. So when we show up, we are not strangers. We are family. And therefore, they love us. I dare say, the elder members of our family didn’t realize the bonds they were forging in all those years of showing up, helping out, and supporting that community of faith. They just went about their daily lives, but were intentional in being an integral part of that church family. My husband’s grandmother once told me she had been a member of the same Sunday school class for over 70 years. And I believe in those years, of serving together, praying for each other, and going through life together – family was forged. And here we are today, my children call that place, “our church.” They already know that this is place where they can go to be loved and cared for. All because the blood of Jesus Christ has created something strong and unified there. It is a legacy that I am eternally grateful for. I ask you, friends, what kind of legacy are you creating for your children? Think about it? When you are no longer in the picture, who will care and love your family without fail, just because of the relationships you have built? Are you creating a “family” for them that they can trust and run to if times get hard? It is a question worth asking for the sake of our future generations. The enduring quality of the church is that it isn’t built on temporal promises. It is built on the foundation of Christ’s love for us. It goes on forever. And we are part of the family, not due to some random occurrence, but because His blood is thick enough to bind us all together for the long haul. It is that time of year again. The excitement wells up in my chest, my mind begins racing with ideas and possibilities, and I can’t wait because of the anticipation building in my soul. What is going on, you ask? Those of you that know me well may have already guessed: IT’S STRATEGIC PLANNING TIME! That is right, it is the time of year that I sit down with Pastor Wade and discuss our dreams and vision for the coming years. I love this time because I get to spend some great time with God, asking what He wants to do next. I get so excited to re-visit where we have been as a church and where He is leading us next. How will we worship? Which leaders is He raising up for His mission? How are we being called to minister and love those around us? How will we, as a congregation, come to know Jesus more intimately? I create my planning and goal objectives with several different time frames in mind: the immediate, 1-3 years, and 5-10 years. And each year I re-visit those longer-term plans, adjusting for any changes that might be needed. You might think planning that far in advance is strange, however, we have occupied this church for over 8 years now, and it has gone by in the blink of an eye. We have to continually be looking at the future, or it will pass us by and take our opportunities for reaching others for Christ with it. The point today is that I wanted to share the method I use for planning. It is the best gift from God I can receive and I believe it isn’t contained to church leadership. For anyone that is hoping to make good decisions, I believe cultivating a means of listening to God is essential. I go to my quiet place. 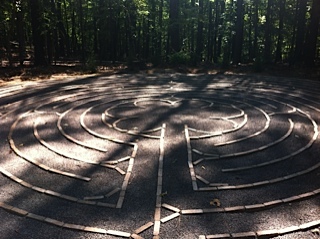 I personally have several, but yesterday I spent a couple of hours at our church prayer labyrinth. 3. Instead, I clear my mind as best I can with all my pre-conceived notions. After all, He may be leading us in a completely different direction, and I need to be open to that. Then I ask God to show me, in a way that I can understand, where He wants us to go, what He wants us to do. 4. Then I wait. And listen. 5. Then I wait and listen some more. 6. I bring a drawing pad, a bible, and my journal with me. I continue to write or draw anything that comes to mind. 8. I just listen and record whatever message or vision He shows me. Then I agree to do whatever it is to be the best of my ability. 9. Then I come back again the next day, and the next. And I continue to pray the same prayers and ask the same questions and record whatever I receive. And eventually, I have a plan of action and a peace of heart that I am headed in the right direction. The key is, I keep coming back until I have what I need to proceed. Sometimes it takes a day, some times I come every day for months. But the secret is that I keep coming. Just like the persistent widow, I have faith that if I keep asking, God will answer. And not only does He answer, He gives me a good plan. I never worry that I made the wrong decision or choice. I never second-guess myself. And I never have any anxiety about what might be coming in the future. I have peace. My friends, I hope that you have the ability to withdraw from the world and work through your decisions with God. I hope that you have a place to meet with Him. And I hope that you have the patience and wisdom to seek Him continually. The blessings of His presence in such matters are too numerous to count. And as followers of Christ, we are called to walk with Him in all things. There is grace in the everyday with Him if we will only seek it out. 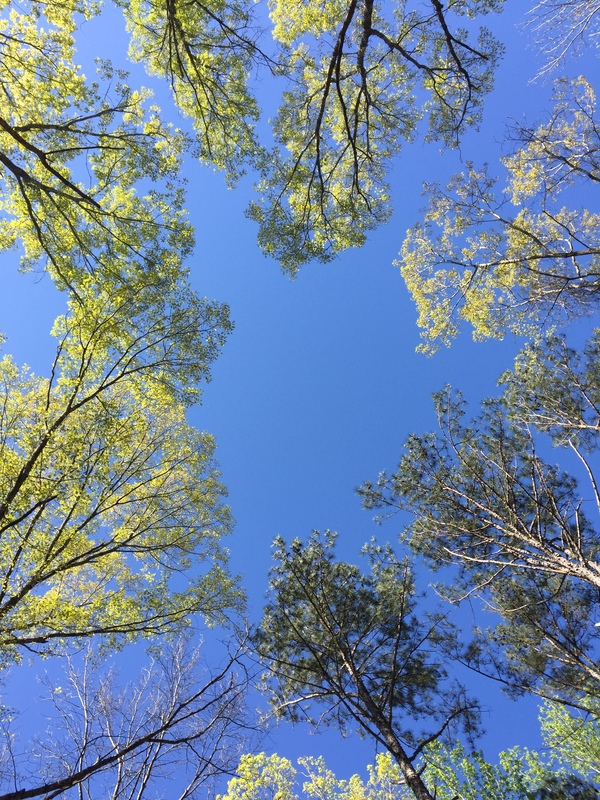 In my prayer time at the labyrinth, I spent a good deal of time lying on my back in the center. This was my magnificent view. It changed my perspective on several ideas. I had my devotion all set in my head this morning. However, I saw something on the way to work that I just had to share. The road I take to work is what we in Alabama call a backroad. Not a major highway, just a small two-lane road that meanders its way through woods. So I set out for work; weary, sad, and just trying to make it through the day. And God reached down and touched my heart with a sprinkling of pure joy, a manifestation of His unending grace toward me. I saw coming toward me a really big truck. You know the kind that are common to this part of the country, the kind with tires taller than me. As I watched this monster come roaring toward me, I noticed something flicker outside of the driver’s window. “That person better not be throwing trash out their window,” I thought. Because I was just in the right mood to take on anyone driving that behemoth. After all, diligent members of my church family routinely go out and clean up the trash people throw on to the road. I was ready to confront the offenders. But upon further study, I noticed that the image flowing out of that window was not trash at all. As I peered into the cab of the truck, I could see that it was occupied by two nuns, fully dressed in their habits which were blowing in the breeze of the windows. As they flew past me with their engine roaring and their big tires churning, I noticed that they were both cackling at the tops of their lungs! Picture it friends, can you imagine such a sight?? Now I don’t know about you, but this doesn’t fit the picture I have in my head of how nuns normally live. I don’t actually know any, but I tend to think more of quiet, prayerful people living in stone fortresses rather than rip-roaring partiers roaming the backwoods of Alabama. I mean, they aren’t supposed to be having that much fun are they? But what I realized in that brief, precious encounter was that, yes indeed, they were supposed to be having that much fun. My heart was lifted in those few seconds and a smile spread to my face as I recalled the wonderful promise Jesus gave us in John chapter 15: Your joy will overflow. What a fantastic reminder! But on this glorious spring day my friends, let us remember that Jesus went to parties. Jesus had friends and deep relationships. Jesus even drank wine. So I am sure that He also laughed and experienced great joy. And He promised to fill us completely with His joy through the Holy Spirit. We need to embrace that fact and learn to live in a joyful state of mind while worshiping God instead of feeling guilty about it. There are times, like today, that I don’t feel much joy. However, I am reminded that I have much more in my life to celebrate than to lament. All I have to do is stay connected to the source of that divine joy. All I have to do, is turn myself over to His tender mercies and He fills me with His presence and His joy. All for free. Just because I am His beloved. Praise God, the Father, who continues to flow grace over me and show me the real way to live. And may He abundantly bless the nuns in the monster truck who showed up at the right time to lead me into abounding laughter. In the name of the Father, and the Son, and the Holy Spirit I pray. I was driving my kids to school this morning and my son commented on the beauty of the trees. We have a huge area of trees right beside the school that are heavy- laden with the most beautiful white blossoms. They are truly spectacular in the springtime. As he marveled at the sight, he commented that “this must be what heaven looks like.” What he didn’t know, was that I had been thinking about heaven for hours. His grandfather died earlier this morning. And when we received the call, I immediately began to wonder about the joyous reunions going on in heaven today. I don’t know what heaven is like. All I have is what the scriptures tell me. And based upon God’s word, this is what I imagine is going on there right now. After his long-fought struggle with cancer, he has a new body. One that is strong, glorious and pain-free. – Thank you, Lord, for that gift. He is no longer suffering from the mental ravages of both a disease and the loss of many loved ones. Thank you, Lord, for your tender mercy. He is filled with pure joy because he is in the presence of his Savior. Thank you, Lord, for your extravagant grace. He is experiencing the warmth and security of his true home, the one created especially for him by our Almighty Creator. Thank you, Lord, for your eternal provision. I honestly don’t know what heaven is like. But I believe it exists and my sweet father-in-law did too. I believe he is there right now, dancing with his bride that left us far too early. I can only imagine that his infectious smile and laugh has returned because of his joy in the presence of pure Perfection. And I truly believe he has a peace that we can’t comprehend, because he finally sees the whole glorious picture of Christ’s plan for us. My heart is filled with joy and thanksgiving as I sit imagining the Johnson residence in heaven. Because I know, as Jesus promised, that Poppy is living in a paradise beyond our wildest dreams. I also know that there is a place for me there as well. And one day, our family will be reunited there with much joy. It is my hope and prayer that each one of you have the same assurance in your heart. Our Lord loves each of you and His grace is available to all who call on Him. Glory be to God, and thanks be to our Savior Jesus Christ!